No matter what temptation drove you to Singapore, you'll find your desires fulfilled at the Vagabond Club. Hedonism, wellness, luxury, and leisure all course through every aspect of the Vagabond Club, each of them combining to provide you with a one-of-a-kind experience in Singapore. Every visit to the Vagabond Club has its own qualities that make it entirely unique to you. From your first moment until the last you will experience the sights, sounds, smells, and sensations of Singapore in new and inventive ways. There is a never ending element of growth and change happening throughout The Vagabond Club as well as Singapore itself, ensuring that no visit is exactly the same as the last. The Vagabond Club strives to provide next level services for our guests. 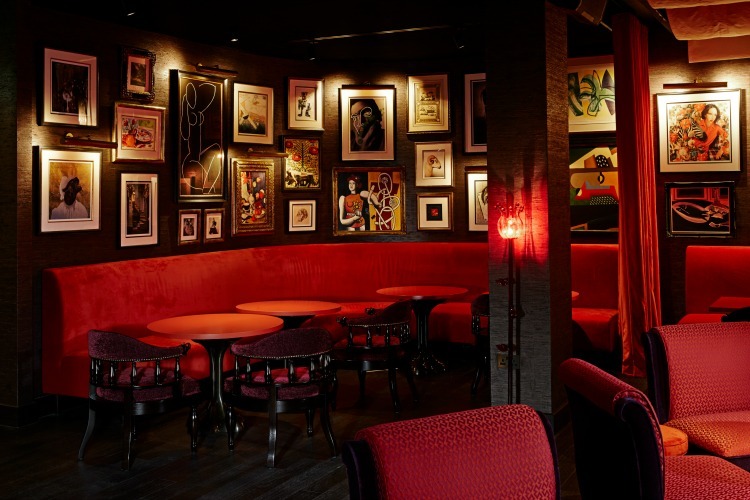 Whether you are an elite guest receiving special benefits upon check-in, or an artist-in residence showcasing your talents, your next visit to the Vagabond Club will be unforgettable. "Quirky hotel decor provides a boutique experience unlike any other hotel I have ever stayed in. 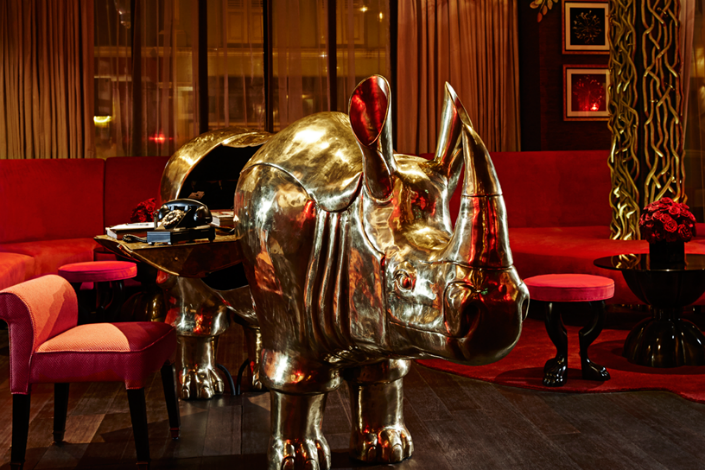 From the Brass rhino acting as reception table to the golden leaf tress covering part of the ceiling this is for visitors hoping to avoid the sterility of much of contemporary hotel design." The Values of the person!!! I really loved to be there. Wow! What a great hotel! We and another couple are unanimous in our opinion that the Vagabond is the finest hotel we have stayed in all over the world. A unique décor and absolutely outstanding service are its trademark. The lobby and bar are friendly and comfortable, with food and drink for all tastes. There really are no words to describe the incredible service except to mention the sign next to the room phone, “Dial 0 for everything.” We asked a staff member to make a lunch reservation at Spago, the Wolfgang Puck restaurant atop the Marina Bay Sands Hotel. He advised that the line was busy because it was the weekend, but said he would follow up and then call us when he had confirmed the reservation. He did a couple of hours later and we enjoyed our lunch. The rooms are well furnished, have comfortable linens and towels, offer a coffee maker, provide reliable and strong wi-fi, and even have an internet phone where we could make free calls to the US. The hotel is close to two MRT stations and a hop-on/hop-off bus. There are numerous restaurants within walking distance. The room rate is significantly less than many of the large chain hotels, so all in all this is the place to stay in Singapore. From the moment you check-in at the Vagabond Club you will find yourself wrapped in the lap of luxury. Our friendly staff will present you with a welcome letter detailing the highlights of the local area, as well as a complimentary smart phone for you to use during your visit, featuring unlimited local calls and data usage as well as select international calls. Ask about a complimentary art tour and we will walk you through the original works created by our Artists in Residence that are placed throughout the hotel. Experience the next level of hospitality during your visit to Singapore when you arrive at your luxurious guest room at The Vagabond Club. 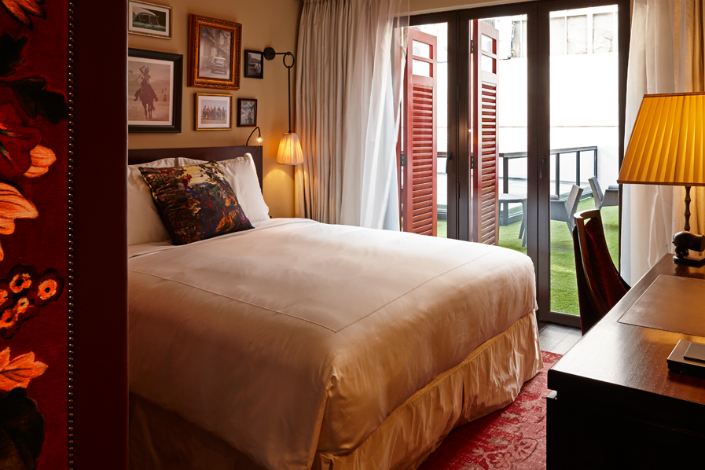 You'll awake each morning on a king-size bed, enveloped in Egyptian cotton sheets. 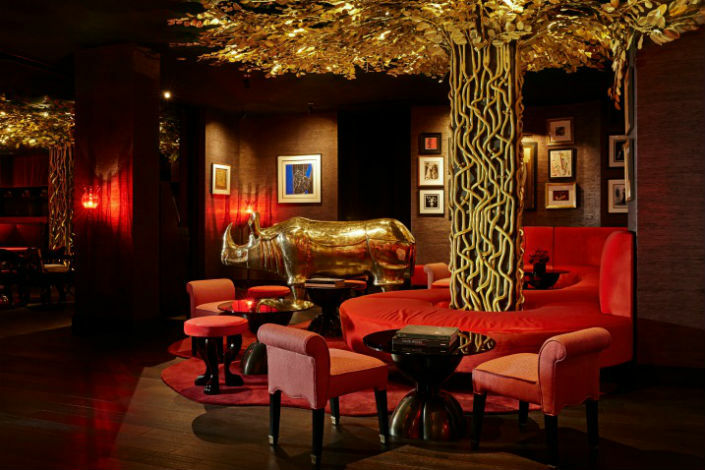 With distinctive art in each room no two are exactly alike, making your visit to Singapore one-of-a-kind. 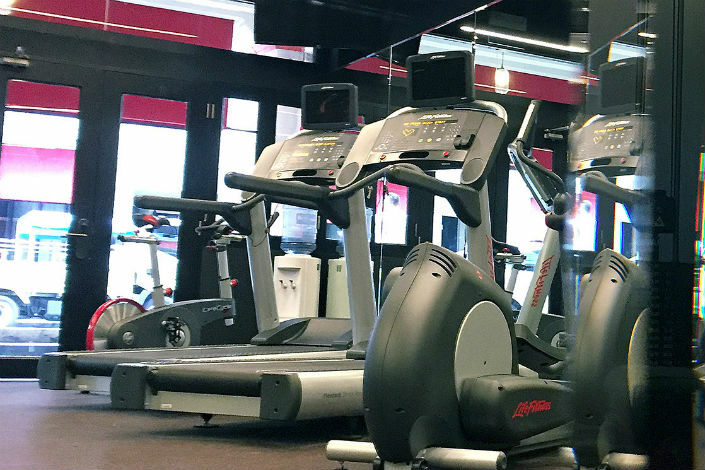 During your visit to the Vagabond Club, you will have access to a plethora of on-site services that will bring your experience to the next level. Live in luxury during your stay in Singapore with all the benefits of a VIP. 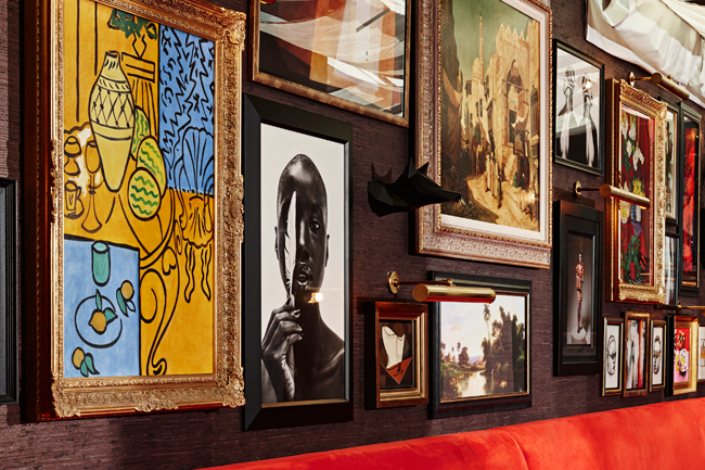 Upon check-in at the hotel you will be whisked away on a complimentary tour of the artwork around the Vagabond Club. Over the years we have collected a wide variety of works from around the globe, photographs from Satinder Garcha's many travels, and through our Artist in Residency program. Each piece carries a unique history and a friendly concierge will walk you though each work to discuss the diverse range of styles that can be found at the Vagabond Club. The Vagabond Club is the first hotel in Singapore to initiate an artist in residence program. Artists from all over the world working in different styles and mediums apply for a residence, ranging from a weekend to two weeks. Writers, poets, musicians, dancers, and painters all come to the Vagabond Club for inspiration and to create incredible works. Visitors can meet with the artists and talk about their journeys can find them at The Vagabond Club. 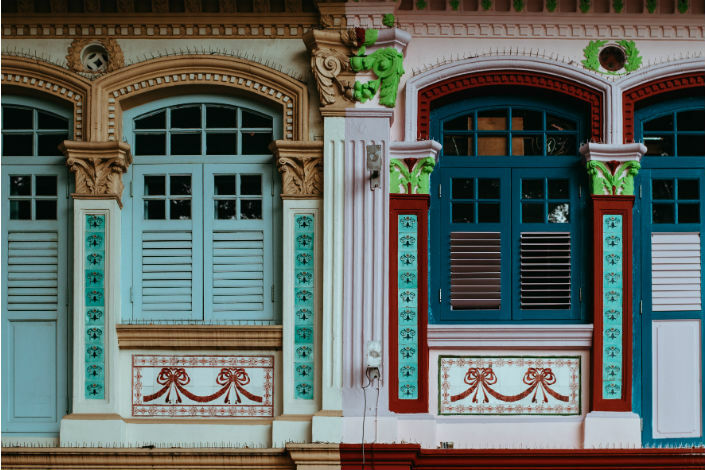 The Vagabond Club is located next to Singapore's Rochor River, the border between two of its premiere districts, Kampong Glam and Little India. Whether you are taking a guided tour of Singapore or using the exclusive tour map provided with your stay you will experience an exceptional adventure throughout Singapore. On the ground floor of the Vagabond Club you will find the Executive Club Lounge, a luxurious oasis in the heart of Singapore, inclusive with all Club Level rooms or available for an additional fee. Visitors to the Executive Club are offered the VIP experience with complimentary snacks, drinks, and entertainment. Open daily from 11:00 a.m. to 6:30 p.m.
Complimentary á la carte lounge menu from 11:00 a.m. to 4:00 p.m.
A spread of complimentary hors d'oeuvres, fine wines, and spirits from 4:30 p.m. to 6:30 p.m.